After getting clothed in the morning have you ever taken a moment while stuffing face with pop tarts to contemplate what exactly you have put on and around your body and why you have chosen those particular items? What do they mean? What are those ridiculous shreds of fabric adorning you, and what do they say about you as an individual, as well as the time and place and situation in which you live? 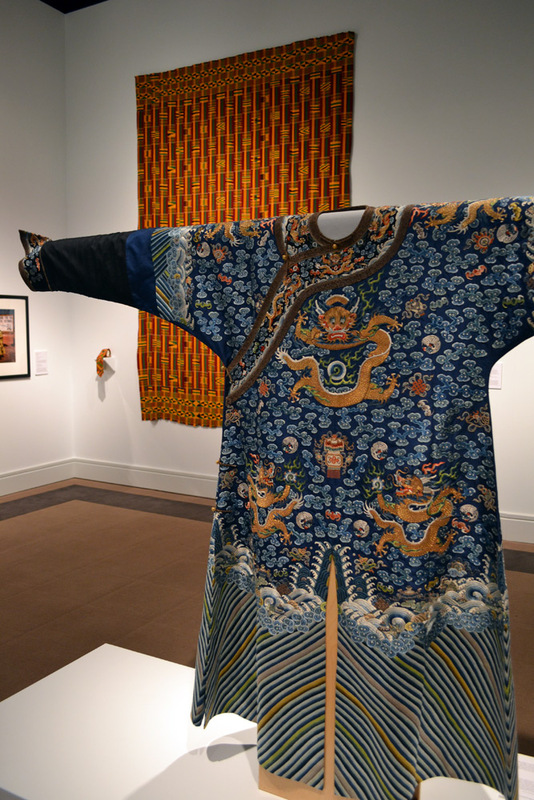 At N.C. State’s Gregg Museum of Art and Design ,visitors can simultaneously time-travel and tour the world as they delve into the current exhibition, Barkcloth, Bras, and Bulletproof Cotton: The Powers of Costume. 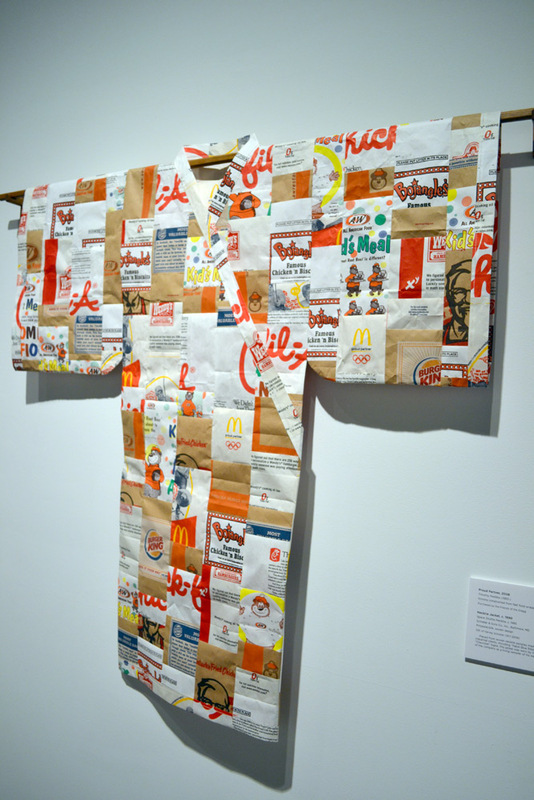 The exhibit features apparel, accessories, paintings, and photographs representing a plethora of times and places,urging one to step back and reassess why people wear what they wear. The story of textiles and clothing design is one that parallels the social, economic, technological, and political histories of our world. Any given article of clothing has much to tell about the past as well as about the individual to whom it belonged. A costume may have been worn to portray superiority and power, to allow the wearer to identify himself with part of a group, to be used as a medium for personal expression, to make a statement for religious or superstitious purposes, or to render oneself more attractive to another. In the chilled air-conditioning of the gallery, I barely resisted the urge to swaddle myself in a Navajo tapestry or Chinese dragon gown. Near the back of the gallery, tiny mirrors on an Indian choli (woman’s top) flash and reflect to divert the“evil eye,” a malicious or jealous glare from a neighbor which brings bad luck upon the recipient. 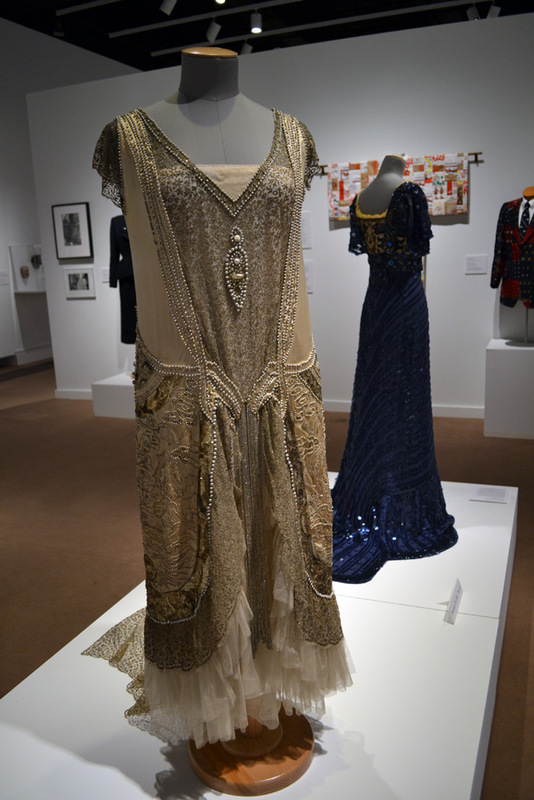 Vintage police uniforms explore the idea of authority and power created by different clothing styles.An elaborately bejeweled 1920s flapper dress represents women’s liberation and the coming of a new age. Ceremonial masks from Guatemala and the Congo stand in glass cases in the middle of the gallery, and Depression-era black-and-white photography by such renowned documentarians as Dorthea Lange and Walker Evans furnish the walls. Some items are stunning, some are silly, others just plain ridiculous. The absurdly small Chinese lotus shoes, for example, which would bind a grown woman’s feet into a four-inch slipper, and the modern platform fetish boots beside them are completely impractical.One of my favorites, a kimono made from recycled fast food wrappers, is brightly decorated with Chick-fil-a, Bojangle’s, and Wendy’s logos. Take a step back in time and contemplate your garb a bit at Barkcloth, Bras, and Bulletproof Cotton: The Powers of Costume until August 31.